Tanaka is known for their high-quality tools, and the Tanaka TCH22EBP2 Gas Hedge Trimmer is no exception. 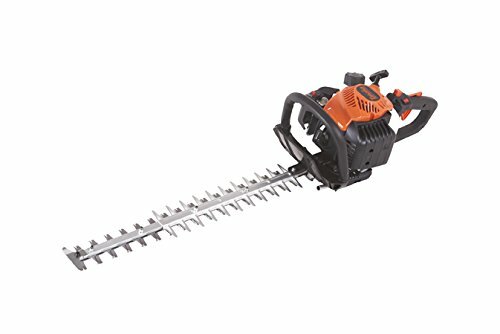 This is a commercial quality hedge trimmer aimed at professional landscapers, and its light weight and powerful engine make it perfect for any homeowner looking for a professional finish for their yard. One of the quietest on the market, this hedge trimmer runs at 87 decibels, making it perfect for quiet neighborhoods. For those looking to invest in surprisingly powerful trimmer that will last, the best Tanaka TCH22EPB2 features are right up your alley. Many professional and non-professional landscapers find that gas-powered tools can be noisy, smelly, heavy, and difficult to start. Loud engines can wreak havoc on your relationships with your neighbors, exhaust can aggravate allergies and lung problems or even damage the hedges you’re trying to maintain, and it can take an aggravating amount of times to get the pull-cord on a tool to work. Heavy gas trimmers can also be difficult to position and not ideal for tight spaces and more detailed work. For those who have experienced problems with gas-powered hedge trimmers in the past, the Tanaka TCH22EPB2 is a surprisingly quiet, easy-to-start powerhouse. This model was rigorously tested for performance and durability to ensure its quality was up to the Tanaka standard, and it shows. 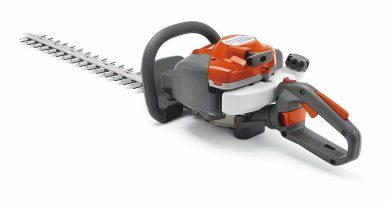 Perhaps the most impressive feature of this trimmer is its powerful PureFire 21.1-cubic centimeter, 2-cycle engine built for power and durability that allows you to cut through the toughest shrubbery with ease and trim more in a shorter amount of time. This trimmer’s purge bulb also prevents flooding and Tanaka’s S-Start technology that includes a spring-assisted pull cord ensure this trimmer starts up easily and quickly (Tanaka claims they reduce the pull-force required by 50 percent). The engine also requires a 50:1 ratio of premixed gas to oil, so be sure to read the manual for more on maintenance. Its rotating handle with comfort grip, combined with Tanaka anti-vibration technology and quiet engine means it runs smoother than standard gas-powered trimmers, reducing strain on the user so you can cut branches for longer. This trimmer’s light weight (just over 10 pounds) and rotating handle mean it’s easier to maneuver, and cutting horizontally or vertically is no problem, perfect for those with tall hedges. Plus, a large 10.1-ounce fuel tank means more time between refills, so if you have a lot of vegetation to maintain, you can trim more without having to stop to refuel. 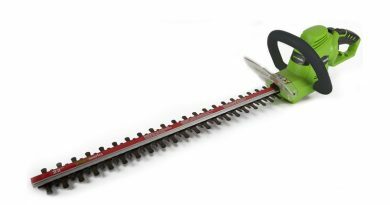 24-inch dual reciprocating, double-sided blades are commercial quality and heavy duty, cutting through branches up to 3/4th of an inch with ease. The stainless-steel blades won’t corrode, keeping them sharper, longer. For those of you who feel like you’re constantly replacing blades, these high-quality blades are a definite plus. 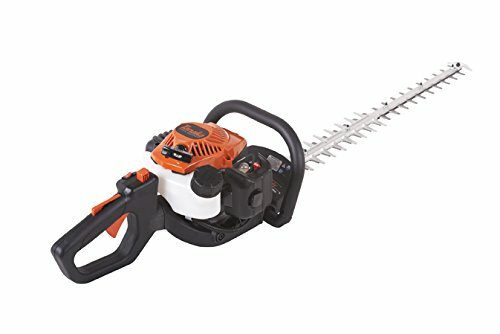 For someone who is shorter than average and relatively small like me, a lightweight, easy to maneuver tool is a must, and while gas hedge trimmers do tend to be heavier than electric, the Tanaka TCH22EBP2 Gas Hedge Trimmer is surprisingly light compared to other brands and models. The rotating handle is great for those who have trouble reaching taller branches, as it makes cutting vertically so much easier, and its 5-way pivot means you can trim from just about any angle. Low vibration means it is much easier to handle for someone my size, and I can trim with way more precision than with heavier, more active models, getting a more professional looking trim without having to actually pay a professional. 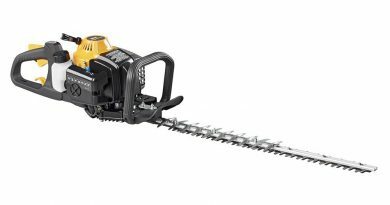 The Tanaka TCH22EBP2 also comes in other blade sizes (20-inch and 30-inch blades) for those with a greater or lesser amount of shrubbery to maintain, though the 24-inch is standard, cutting a 2-foot swath with ease. Though, should you consider a model with longer blades, be warned that longer blades will add more weight and somewhat reduce maneuverability. The forward-facing angled exhaust also keeps exhaust away from you and your hedges, so you’re much less likely to burn them, and you won’t have to suffer the smell of fumes wafting so close to your face. Anti-vibration technology combined with its 5-position, rotating handle and comfort grip make this a great trimmer for longer jobs and for trimming at all angles. The rotating handle increases maneuverability, so cutting vertically and diagonally are much less difficult, and the rotating handle ensures greater precision when handling more detailed work. The Tanaka TCH22EBP2 comes with a 2-year commercial warranty and a 7-year consumer warranty, one of the best on the market. 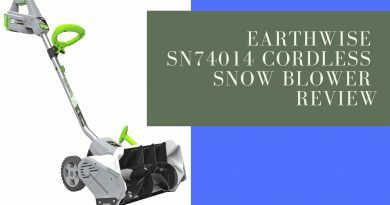 Its powerful, 2-cycle engine gets more done in less time and is surprisingly strong for this trimmer’s light weight and provides the user with a professional-strength, reliable engine. Forward-facing exhaust moves exhaust away from you and prevents burnt hedges. Commercial-grade reciprocating blades cut through more vegetation, faster and are made to last through years of hard work. Because it’s aimed at professionals, it is aimed at more experienced buyers and requires a thorough reading of the manual to be on top of maintenance. Though, for experienced buyers and professional landscapers this won’t be a problem. The price may be a turn-off for some, as it is above average price for a gas-powered hedge trimmer, but for those who don’t mind paying for a higher-quality tool, the Tanaka TCH22EBP2 is worth the higher price. Other users have had trouble finding replacement parts, but with such a great warranty, this shouldn’t be too much of a problem. If you’re looking for a lightweight, powerful hedge trimmer built for tough jobs, the Tanaka TCH22EBP2 Gas Hedge Trimmer is definitely worth investing in. This trimmer balances great cutting capacity with longevity, and can get through surprisingly thick branches for being such a light model. 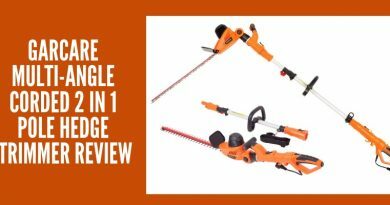 Because this is a professional-level hedge trimmer, it’s made to last through hard days and long hours. The 2-year and 7-year warranties are some of the best offers on the market, so while the Tanaka TCH22EBP2 may be pricey, it’s worth your consideration.